Call our Sales Department for more information. 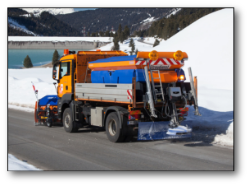 The Schmidt Group, which is active world-wide and has an international service network, offers made-to-measure solutions for all possible de-icing operations. 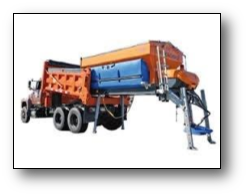 The aim of the innovative silo spreaders with their electronic control systems is to provide extremely precise dosage and distribution of the spreading materials. The modular construction makes possible a variable combination of the component parts which fits in with the individual operational needs. High quality plastic and stainless steel parts make for lasting durability, which is an important criteria for resale purposes. There are Schmidt spreaders for every vehicle and even if the vehicle is changed, they can in many cases be adapted without difficulty. The modular design of our spreaders permits individual configurations that are accurately tailored to your tasks and operating conditions. The combination of hopper, conveyor belt or auger system, pre-wet equipment, various distribution systems, drive options, demount systems and control systems offers maximum flexibility. Whether durable stainless steel or high-quality polyethylene: Our new spreaders employ exclusively high-quality materials. This provides protection for a long service life while reducing maintenance costs. 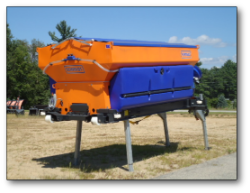 In order to additionally increase their durability, all steel and stainless steel spreaders are blasted and powder-coated.